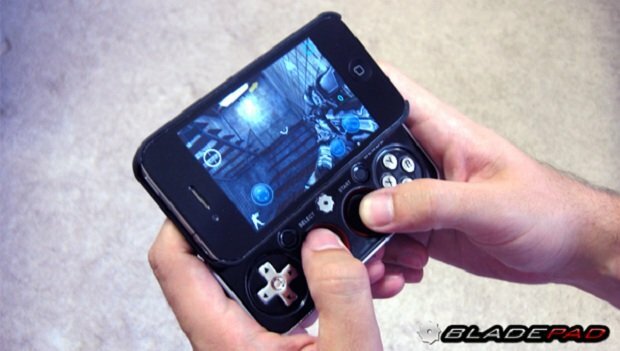 The Bladepad is an iPhone case / Gamepad combo that is currently seeking funding from Kickstarter. It consists of an easily removable iPhone case complete with a clip on gamepad that includes two joysticks, a D-Pad and many buttons to enhance your iPhone gaming experience. Playing games on your iPhone will never be the same! Bladepad brings a full console controller to your phone with a convenient and comfortable gamepad that maximizes portability and minimizes unnecessary bulk. Connect Bladepad to your iPhone via Bluetooth. Place your iPhone in the protective case and the gamepad slides out beneath your phone. When you are done playing, the gamepad slides back in place under your phone. Bladepad makes use of high quality components and materials to provide a durable device that is built to last. Inside is a powerful micro-processor and Bluetooth module from Texas Instruments. Additionally, Bladepad has a real metal bezel made out of the same lightweight and durable alloy that is used in the iPhone 4/4S. The bezel is actually a solid metal plate that protects Bladepad for long-term use. If you would like to be one of the first to try this gamepad, you can become an early adopter with a pledge of $59 or more to secure one should they make it into production. The Bladepad currently has just over $6k of pledges and it needs to hit over $55k to gain enough to be funded. As with all of these Kickstarter projects, just because a particular item reaches its funding total doesn’t guarantee it will be made. I guess the saying goes; you pays your money and takes your choice! There is no doubt in my opinion that gaming on the iPhone is hugely popular but is being held back by the lack of hardware buttons and a joystick. Lots of innovation is taking place on this front as we have already seen solutions from iCade and one or two others. The problem however is that there is no set standard for including support for a gamepad. Developers can chose to support one particular solution or none at all and until that changes, you could well be wasting your money as your favorite games may well not have any gamepad support at all. The only long term solution to the problem would be for Apple to release its own gamepad and give all developers the ability to easily add support for it. Then we will we see most games taking advantage of the gamepad and it will become an essential part of gaming on the iPhone iPad and iPod touch. Can you ever see Apple releasing its own gamepad? Would you buy one if they did?